Claypool’s embrace of Rand and her uber-capitalist philosophy goes a long way in explaining why CPS came to the brink of a second teachers’ strike in four years. “I think the thing that motivates me most is a fundamental belief in the individual. The individual, not the collective and not the state, is what matters,” he told the Windy City Times in 2005 when explaining Rand’s portrait in his office. It’s no wonder, then, why a neoliberal mayor like Rahm Emanuel would choose someone like Claypool to run CPS. The head of the nation’s third-largest public school system has worked for years to dismantle public services like schools rather than strengthening them. This is the backdrop behind Chicago Teachers Union (CTU) vice president Jesse Sharkey’s claim that Forrest Claypool is “unfit” to serve as CPS CEO, a shot across the bow to the head of the city’s school system. Claypool has a long history in public service — or perhaps more accurately, a long history of privatizing public services. Before being appointed to run CPS, Claypool headed two other city agencies: the Chicago Park District (CPD) and the Chicago Transit Authority (CTA). In each of these positions, he relentlessly privatized public goods. When Claypool took over the park district in 1993, he quickly sold off the six city-run golf courses to Kemper Sports Management, a private firm. He then began the gradual privatization of various services in Soldier Field, the football stadium for the Chicago Bears, including parking lots and stadium management. SMG, the company awarded the contract to manage the stadium, has since been mired by accusations of improperly keeping up the turf. After the company subcontracted out security to Soldier Field, in 2015, employees of the hired private guard company were accused of selling security wristbands to undercover cops, compromising the safety of the stadium. These principles of selling off public services and gutting public-sector jobs have continued to guide Claypool’s approach to management throughout his career. Like most privatizations, they have failed at providing decent services time and again. The reality is that privatization usually doesn’t increase efficiency, but it does increase inequality — both economic and political. By introducing the profit motive into what was previously the government’s job, private interests put profits ahead of the needs of a community. Jobs are cut, unions are targeted for weakening or elimination, wages go down, costs go up, regulations are skirted, and corruption runs amok. Despite these corrosive effects, privatization’s boosters — especially those with friends who stand to gain handsomely — still preach its gospel. Forrest Claypool is no exception. Thanks to his experience awarding private contracts and drastically cutting staff at the park district, Claypool labeled himself a “reformer” and soon ran for elected office, winning a seat on the Cook County Board in 2001. There, he made his name by fighting against tax increases meant to fund county services such as health care, positioning himself well in the eyes of the Chicagoland chamber of commerce, “reform” Democrats, and county Republicans. Claypool’s alternative to the tax increases? “The answer is to cut spending,” he told the Heartland Institute in 2003. He went on to run in the Democratic primary for president of the board in 2006. He lost to incumbent John Stroger, who was incapacitated following a stroke at the time of the election. Following another embarrassing electoral loss in the 2010 race for county assessor, Claypool returned to what he knew best: cutting public agencies’ budgets to the bone. Upon his appointment to lead the Chicago Transit Authority (CTA) in 2011, Claypool promised to make “hard decisions.” This amounted to firing nine hundred of the agency’s employees — nearly all of whom were union members — over his four-year term, effectively cutting the workforce by over 8 percent and eroding the transit workers’ bargaining unit. These cuts affected workers across the agency, but they put particular strain on the public transit system’s frontline workers — drivers and conductors whose workloads and hours on the job swelled following this massive staff reduction. The outcome was laid bare in April 2014, when a CTA passenger train tore through a bumper at the O’Hare Airport station, derailing and crashing into an elevator. Thirty-three passengers were injured, along with the train’s conductor, who had worked a staggering sixty-nine hours the previous week. Despite the employee clearly being overworked — stemming from the decimation of conductors’ ranks — she was fired immediately. Claypool’s other legacy at the CTA was the privatization of fare-card services, a fiasco that threatened to fall apart before it was even fully implemented. The transition from a city-run transit fare card system to the privately run Ventra system was marked by confusion, breakdowns, massive delays, and public frustration. When the Ventra cards worked — which was rare — they often double-charged customers. They also were, and remain, riddled with hidden charges like “dormancy” fees that prey upon low-income public transit users. While the public decried these extra fees and unreliable services, a cadre of rich investors made a whole lot of money. As of early 2015, the many setbacks the Ventra system faced during its rollout had already cost the city an extra $65 million over the original contract. In total, Cubic, the company managing the Ventra system, has made at least $519 million off of the deal, while Chicago’s public coffers remain starved of revenue. For these herculean feats of public mismanagement, Claypool was made chief of staff to Chicago mayor Rahm Emanuel, another true believer in the promises of privatization. 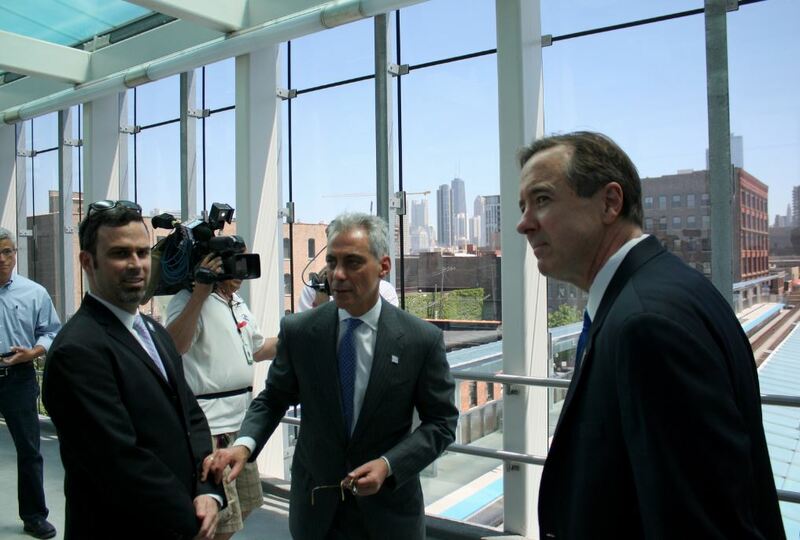 Emanuel, Claypool’s longtime friend, has overseen a massive sell-off of Chicago’s assets and services. From solidifying the privatization of city parking meters, resulting in steep rate hikes and the loss of millions in taxpayer dollars to reselling the Chicago Skyway, now one of the most expensive tollways in the country, to instituting the Ventra deal, Chicago — as led by Emanuel — has earned its reputation as the archetype of urban privatization. We can’t lay all the blame at Rahm’s feet. Many of these deals began under the city’s last mayor, Richard M. Daley, for whom Claypool also served as chief of staff. But this time, Claypool would only spend a few months in city hall, for Emanuel determined that he had a higher calling: to become CEO of the Chicago Public Schools, its third in three years. Claypool never worked as an educator, a fact which once prompted Chicago Teachers Union president Karen Lewis to comment, “I don’t have that much to talk to him about because he doesn’t know anything about education.” But Claypool knows how to gut public budgets, making him the perfect choice for Emanuel, who has overseen massive public school closings, unionized teacher layoffs, classroom cuts paired with ballooning class sizes, a buildup of charter schools, and a combative stance toward the CTU. One of Claypool’s first acts as CPS CEO was to torpedo a proposed one-year contract with the CTU that was being negotiated by his predecessor, instead demanding more concessions and extractions from teachers as part of a longer-term contract. CTU members responded with anger and frustration: “Sheriff Claypool has decided to blow things up and show how tough he can be,” Lewis said in response. After the CTU rejected Claypool’s demand to force teachers to pay out an extra 7 percent of their pension costs, Claypool threatened to unilaterally enact the pay cut. In response, the union organized a one-day walkout on April 1 to demonstrate their opposition — and forced Claypool to back down. In addition to her consulting fee, Claypool hired Rubin on as director of CPS’s project management office, a newly created position that came with a $170,000 salary. Sally Csontos, also an old coworker of Claypool’s, received another newly created position: executive director of change management, starting at $160,000. He also hired Ronald Denard as vice president for school finances for $215,000 and Doug Kucia as chief of staff — a new role that pays $175,000. The Chicago board of education had to approve these personnel changes, but that’s no problem: Emanuel handpicks the board. These hires share a couple of things in common: they are all Claypool’s friends and previous associates, and none of them are educators. Claypool has defended all of these moves with a hand-wave response: “I don’t have to apologize for hiring talented people.” From Claypool’s perspective, however, this talent doesn’t seem to belong to teachers, just under five hundred of whom he decided to lay off this August. This time, jobs were not cut under the guise of efficiency. Rather, veteran teachers, who make higher salaries — and those who had spoken out against the practices of CPS, like Roosevelt High School’s Timothy Meegan and Brighton Park Elementary’s Xian Franzinger Barrett — were targeted. After these layoffs, CPS posted hiring announcements for entry-level teachers who would start at a far lower base-pay salary. And in early October, another 140 teachers and 109 support staff were let go, adding to the tally of public-sector jobs eliminated under Claypool’s leadership. You might think that Claypool would have learned a lesson from the Byrd-Bennett ordeal. But his orthodoxy apparently outweighed any concerns of potential impropriety, and he has carried on with the privatization agenda. Since taking over leadership of the school system, Claypool continued the contracts Byrd-Bennett made with Aramark and Sodexo to privatize custodial services in city schools. These contracts directly led to mass layoffs of unionized janitors and custodians and left schools in horrid conditions. According to CPS principals, many schools were left infested with rats and roaches. Claypool even seems to be making new deals that follow his predecessor’s model. Two of the companies eligible for lucrative consulting work with CPS, Analytic Innovations and Public Services PS Inc., received million-dollar, no-bid contracts with the CTA while Claypool was in charge. Analytic was ultimately awarded a contract with CPS worth upwards of $72,000 to “assess” special education services, while Public Services is owned by Paul Stepusin, a longtime coworker of Claypool’s. The shadiness of his financial deals at the school system has not gone unnoticed: the CPS inspector general has now opened an investigation into Claypool’s contract with a law firm he once worked for, which cost the school system at least $182,000. But the biggest privatization scheme in the educational sector — charter schools — has Claypool to thank for their continued success in Chicago. The first budget Claypool approved as head of CPS included significant cuts to neighborhood schools, including in special education and busing. Charters, however, were spared entirely. This despite the fact that studies have shown that charter schools overall do not outperform public ones. In CTU vice president Sharkey’s devastating assessment of Claypool’s term heading CPS, the CEO has “run the system off the edge of a cliff,” earning him “the contempt of teachers and parents across the city.” Even without going on strike, the teachers’ union has made clear that they’re not going to sit back quietly while an austerity-pushing CEO remains in charge. In the face of opposition like this, wrestling more funding for public schools and resisting cuts would be a victory not only for teachers and students, but in defense of education as a public good against privatization junkies like Forrest Claypool and his ilk who would rather put it under corporate control.